This black, single, RG-6 coax cable has a copper clad steel center conductor and comes 1000’ in an easy to use pull box with internal rolling reel. Works great for all of your cabling needs! Product-specific information: Product details, Specifications, Dimensions. This black, burial, single, RG-6 coax cable is UL Listed, has a solid copper conductor wire, SBCA compliant, includes a grounding wire and comes 1000' in an easy to use pull box with internal rolling reel. DIRECTV™ approved. Product-specific information: Product details, Specifications, Dimensions. This white, single, RG-6 coax cable is UL Listed, has a copper clad steel center conductor and comes 1000' in an easy to use pull box with internal rolling reel. Product-specific information: Product details, Dimensions. This black, single, quad shield RG6 coaxial cable has a solid copper center conductor. It is UL Listed and comes 1,000' reel in a box. Works excellently for all of your cabling needs! Product-specific information: Product details, Specifications, Dimensions. This black, single, RG6 coaxial cable has a braid coverage of 60%, a solid copper center conductor wire and comes 1,000' reel in a box. Works great for all of your cabling needs! Product-specific information: Product details, Specifications, Dimensions. This black, single, RG-6 coax cable has a copper clad steel center conductor, a grounding wire, is UL Listed and comes 1000' in an easy to use pull box with internal rolling reel. Works excellently for all of your cabling needs! Product-specific information: Product details, Specifications, Dimensions. This black, single, RG-6 coaxial cable has a copper clad steel center conductor wire. Packaging: 1,000' EnviroReel ReeLogic Reel. Product-specific information: Product details, Dimensions. This black, single, RG-6 coax cable is UL Listed, has a copper clad steel conductor and comes 1000' in an easy to use pull box with internal rolling reel. Product-specific information: Product details, Specifications, Dimensions. This black, dual, quad shield RG-6 coax cable is SBCA compliant and UL Listed. It has a solid copper center conductor and comes 500' in an easy to use pull box with internal rolling reel. Excellent coax for all of your cabling needs! Product-specific information: Product details, Specifications, Dimensions. RG6 Tri-77% MaxPipe Bonded CATV Black 1000 FT Reel in Box. This black, dual, RG-6 coax cable is UL Listed, has a copper clad steel center conductor and comes 500' in an easy to use pull box with internal rolling reel. Product-specific information: Product details, Specifications, Dimensions. This PerfectVision black, single, RG-6 coaxial cable has a solid copper center conductor, includes footage markers every 2’ and comes a 1000' reel in a box. Both indoor and outdoor use. HughesNet approved. Product-specific information: Product details, Specifications, Dimensions. This black, dual, RG-6 coax cable is UL Listed, has a copper clad steel center conductor and includes a ground wire. Comes 500' in an easy to use pull box with internal rolling reel. Product-specific information: Product details, Specifications, Dimensions. This black, dual, RG6 coaxial cable has a copper clad steel center conductor. It is UL Listed and comes 500' reel in a box. Works wonderfully for all of your cabling needs! Product-specific information: Product details, Specifications, Dimensions. Cable, PV RG6 SC Dual GD-500 ft.(64 Broadband) Black.. This black, dual RG-6 coax cable is UL Listed, has a solid copper conductor wire, is SBCA compliant and includes a grounding wire. It comes 500' in an easy to use pull box with internal rolling reel. Product-specific information: Product details, Specifications, Dimensions. 6 Series, Trishield, 60% Braid, BLK PVC, .051" messenger. RG6, Trishield, 60% Braid, PVC Jacket, BLK. This black, single, RG-6 coax cable is UL Listed, has dual shielding and a copper clad steel center conductor. It comes in 1000' reel. Product-specific information: Product details, Specifications, Dimensions. RG6 60% MaxPipe CATV Blk 1000 FT Reel in Box. This black, single, RG-6 coax cable is UL Listed, has a copper clad steel center conductor and comes 1000' in an easy to use pull box with internal rolling reel. roduct-specific information: Product details, Specifications, Dimensions. RG6 60% MaxPipe CATV Wht 1000 FT Reel. 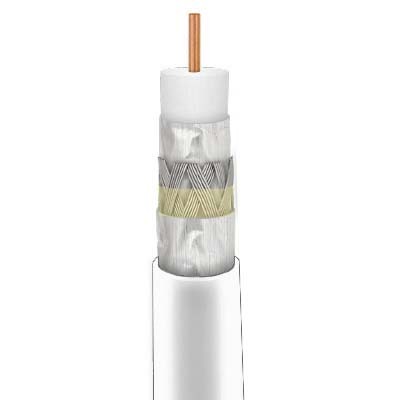 This MaxPipe™ white, dual-shield, single, RG6 coaxial cable has a braid coverage of 60%, a copper clad steel center conductor wire and comes 1,000' per reel. Outstanding coax for all of your installation needs! Product-specific information: Product details, Specifications, Dimensions. RG6 60% MaxPipe CATV Wht 1000 FT Reel in Box. This white, single, RG-6 coax cable is UL Listed, has a copper clad steel conductor and comes 1000' in an easy to use pull box with internal rolling reel. Product-specific information: Product details, Specifications, Dimensions.